Many scholars and commentators had termed the 2014 Indian national election as being historic and epochal, where a single party, the Hindu nationalist Bharatiya Janata Party (BJP) led by Narendra Modi was able to win a majority after over two decades of minority or coalition governments. 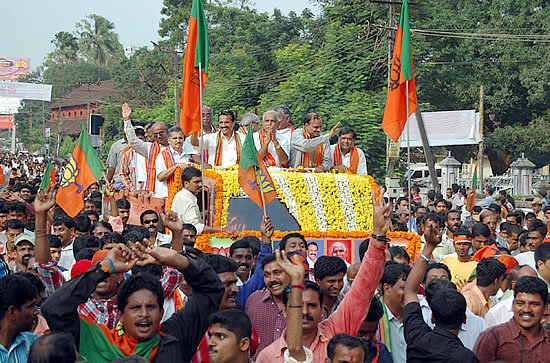 The transformational nature of the 2014 election appears to have been confirmed by the BJP’s consolidation in subsequent state assembly elections, with the party replacing the Congress as the country’s principal national party, and Prime Minister Modi emerging as one of the most powerful political leaders in India’s post-independence history. BJP’s dominant position has raised huge expectations, and the party will need to demonstrate clear progress towards delivering its electoral promises, even as it remains well positioned to win the next national election in 2019. 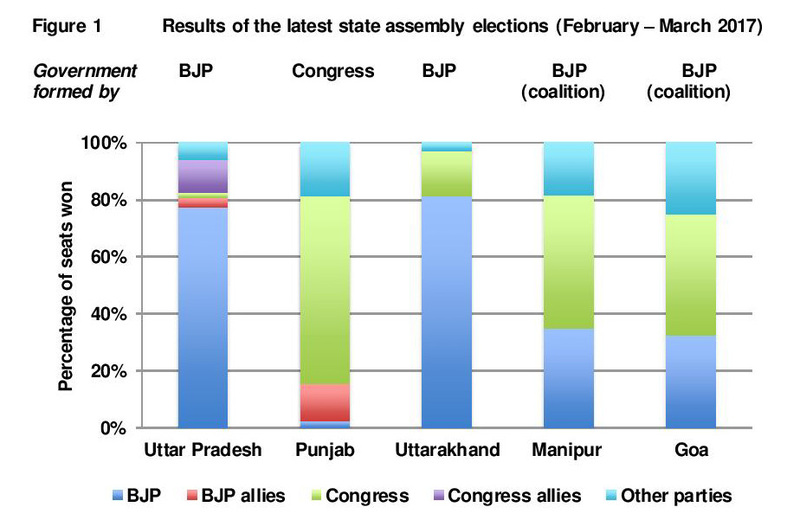 The latest round of state assembly elections was held during February-March 2017 in the states of Uttar Pradesh (UP), Punjab, Uttarakhand, Manipur and Goa. The BJP swept the elections in UP, the country’s most populous and electorally important state, Uttarakhand, and also succeeded in forming coalition governments in Manipur and Goa despite finishing second to Congress in respect of number of seats. Punjab was the only state where the Congress emerged victorious and returned to power ending the decade-long tenure of the coalition government comprising Akali Dal, a regional party, and the BJP. The BJP already had a majority in the Lok Sabha, the lower house of the national parliament, by virtue of its victory in the 2014 national election, and its performance in the latest state assembly elections will help it to gain control of the Rajya Sabha, the upper house, which has a role in passing legislation. In addition to being in power at the centre, BJP now controls governments in states comprising more than 60% of India’s population, and with no clear signs of Congress’ revival, and poor performance of many prominent regional parties in the latest state assembly elections, the BJP has emerged as the dominant national party in India. At present, none of Modi’s opponents appear capable of matching his persona and following, and he remains on course to win another term in power for the BJP in the 2019 national election, barring any major governance or economic crisis. The BJP’s status as a dominant party presents both opportunities and challenges for Indian democracy. Due to its control over the central government, the national parliament as well as most of the state governments, the party is well placed to implement its manifesto promises, including reforms and measures to facilitate rapid economic growth and development. This situation is in contrast with the long phase of minority or coalition governments in India that were constrained by the views of a large number of heterogeneous parties constituting them. A single party government led by a dominant party also has the advantage of maintaining political stability in the country, and establishing clear accountability for its performance. The BJP has argued that the latest state assembly election results in UP, which saw the two regional parties – the Bahujan Samaj Party and the incumbent Samajwadi Party (that fought the election in alliance with the Congress), which had grown by mobilising specific caste groups – reflected voters’ shunning politics based on identity in favour of an agenda of inclusive development promised by the BJP. A single party majority government can also potentially diminish the incentives for parties to engage in clientelistic promises to specific groups of voters. The BJP’s ascendancy also entails many challenges for Indian democracy, especially in the absence of an effective opposition at the centre and in many states. It can lead to a more autocratic and centralised brand of politics akin to what Congress’ Indira Gandhi practiced after the 1971 national election, which culminated in the imposition of a national emergency and suspension of civil liberties during 1975-77. Emboldened by its electoral success, the BJP could also more vigorously pursue a radical form of Hindu nationalism encouraging or condoning the divide between the majority Hindu community and the minorities, in particular the Muslims, to further consolidate the Hindu vote in its favour. So far, Modi and the BJP have continued to stress their focus on inclusive development for all sections of society but the concern still remains, especially after the party’s decision to appoint Yogi Aditya Nath, a popular local leader and an MP since 1998, who has in the past made controversial statements about minorities, as UP’s Chief Minister. Given India’s social diversity in respect of religion, caste, language and region, there has been an inherent tendency for successful national parties to move towards a centrist political agenda in order to attract a wider section of the electorate. Accordingly, the BJP may decide to moderate its stand on Hindu nationalism, and instead use the mandate given to it to implement a more inclusive development agenda. Alternatively, it could decide to aggressively pursue its Hindu nationalist agenda if it considers it to be electorally expedient, which however may also lead to opposition parties uniting against it, similar to what happened in 1977 against Indira Gandhi after a period of emergency rule. It is important to note that the BJP’s victory in the 2014 national election was achieved on the basis of a relatively small 31% vote share, and therefore, the party remains vulnerable to even small swings in its vote share under the single member plurality electoral system, and the threat of opposition parties uniting against it. According to one definition, a dominant political party is able to deny a significant section of the ideological spectrum to any other rival party even if the level of its success can fluctuate depending on its own policy choices and the strategies adopted by the opposition parties and the level of co-ordination amongst them. As things stand now, the BJP appears to have succeeded in dominating the ideological space by straddling an agenda based on inclusive development for all sections of the society, in particular, the poor, and religious appeals to consolidate the Hindu vote. Although it is too early to judge how sustainable this two-pronged electoral strategy will be in the future, a new era in the country’s politics and party system has been ushered in following the latest state assembly elections, where the BJP is the new dominant party that is the centre of the Indian political scene, and Modi the country’s most powerful leader. It is also unclear how the opposition parties will counter the BJP’s dominance especially in the absence of a leader that can match Modi’s national stature. However, the BJP’s dominant position has raised huge expectations, and the party will need to demonstrate clear progress towards delivering its electoral promises, even as it remains well positioned to win the next national election in 2019. Education and Well-being in India: Where are we Headed?